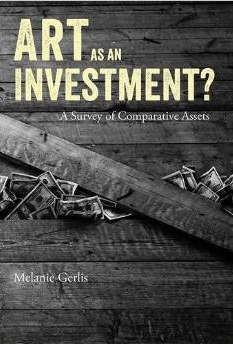 Art as an Investment by Melanie Gerlis, Lund Humpries, 2014, Hardback, A Review. In Art as an Investment Melanie Gerlis successfully manages to strip away some of the mystique on how art acts an investment. Her format consists of a series of chapters comparing the record of art as an investment with other investments such as the Stock Market, Gold, Wine, Property, Private Equity and Luxury Goods. Cambridge educated Gerlis is well qualified to write on this aspect of the art market having been Art Market editor of the Art Newspaper since 2006. After an exhaustive trawl through the art market she comes to the conclusion that the jury is still out on whether art works as a pure investment. She points out that, despite all the hype and media coverage, the art market is tiny is comparison to other proper investment markets such as stocks and bonds. For example, Skate’s Art Investment Handbook estimates the total amount of tradable art in circulation at any one time as about US$400bn as opposed to Apple’s market capitalisation of US$425bn. And despite the best efforts of Art Funds to try and persuade investors that the art market can be quantified in similar terms to other more traditional investments there are numerous difficulties with this such as secrecy and valuation. Gerlis points to art’s growing status as an investment as a collecting category and in the public imagination. However, paradoxically, when it should be seeking more transparency, if it wants to become more accessible as a pure investment, it is actually becoming less so as the auction houses are increasingly selling a higher percentage of items via their private sales departments where they do not have to reveal the figures. In addition to her excellent analysis of the art market, written in a balanced style that is accessible to the layman, she also gives good introductions to the workings of the other markets she examines such as private equity and the wine market. One suspects that Gerlis enjoyed her own journey of discovery through this book as she was forced to talk to experts in various non art-related fields to learn more about the other markets that’s she covers here. Whilst there is money to be made in the art market there are considerable barriers to entry in terms of knowledge, obscure market practises and valuation. Those who do well in the art market are a small group of knowledgeable insiders, or those who pay for the knowledge of this select few, and the rest are just cannon fodder who make up the numbers. The art market has always been thus, and because it is too small and too obscure to regulate, it will most likely long remain so. This is in an excellent book, written in a lively and engaging style and Gerlis is to be commended for a fine attempt at trying to demystify this opaque and little understood market.